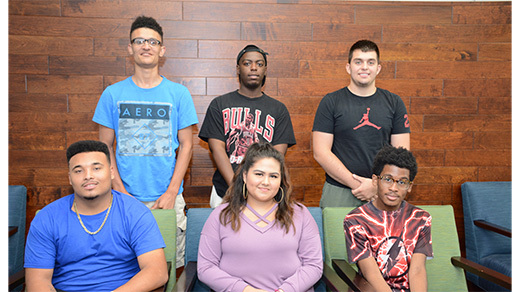 Among the inaugural students participating in the Upper Iowa University and Northeast Iowa Community College Bridge to Success program are (seated, l-r) Kiandre Morris, Mendota, Illinois; Leslie Cortes, Chicago, Illinois; Nathanael Berry, Chicago, Illinois; (standing) Cameron Brown, Ankeny, Iowa; Tyvon Tigues, Chicago, Illinois; Darien Gina, Milwaukee, Wisconsin. Upper Iowa University President Dr. William R. Duffy and Northeast Iowa Community College (NICC) President Dr. Liang Chee Wee officially opened the “Bridge to Success” and welcomed the program’s first cohort of students to UIU’s Fayette Campus Thursday, August 23. 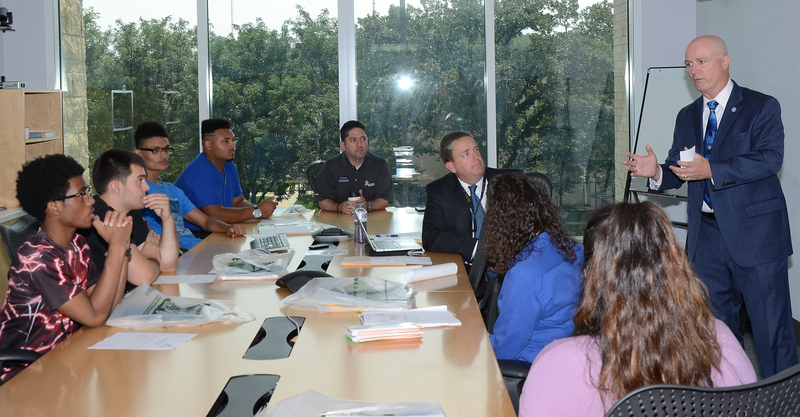 UIU President Dr. William R. Duffy (standing) was joined by NICC President Dr. Liang Chee Wee and other UIU and NICC staff members in welcoming the inaugural Bridge to Success program students to Fayette Campus. skills and completing college credits that fully transfer to UIU. Students in the cohort will live on the University’s Fayette Campus, receive academic and advising services from both institutions, and attend classes taught by visiting NICC faculty. Upon successful completion of the Bridge to Success pathway, students continue their education at UIU to earn a four-year baccalaureate degree. In addition to receiving an excellent education, students receive writing and tutoring assistance from UIU staff. Most important, graduates of this program depart UIU realizing they received a quality education from both NICC and UIU, and their degrees and experiences inside and outside of the classroom are the foundation for future success. As students complete transferable course credit to UIU they enjoy many amenities and benefits, including student residential life, campus living, events, and other educational and career resources. 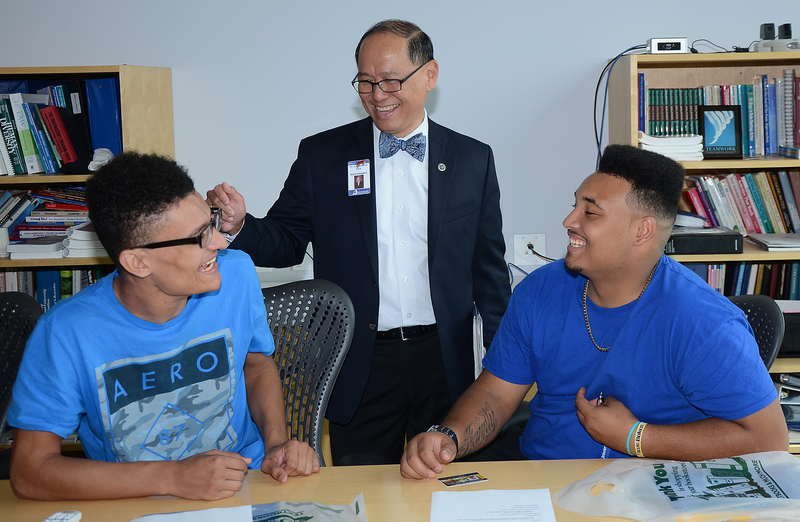 NICC President Dr. Liang Chee Wee discusses academic and career plans with incoming Bridge to Success program students (seated, l-r) Cameron Brown of Ankeny, Iowa, and Kiandre Morris of Mendota, Illinois. velopment by encouraging students in the region to stay in Iowa, stay in college, pursue local careers and contribute to the regional economy of northeast Iowa after graduation. The Bridge to Success welcome was part of UIU’s 2018 Peacock Experience. On Thursday, August 23, a mass of volunteers welcomed new students to Fayette Campus and helped them move into their residence halls. Four days of Peacock Experience events, orientation and entertainment follow.